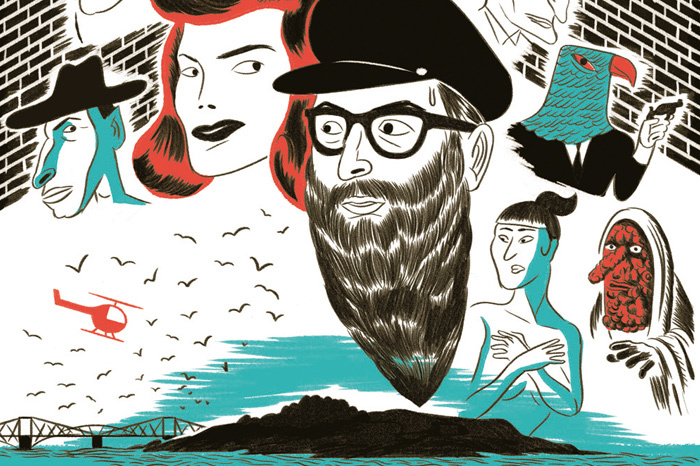 Nobrow Press | Cramond Island – Coming out in the UK from Nobrow Press this month! Cramond Island – Coming out in the UK from Nobrow Press this month! Jean Baptiste has been living in a cottage with his girlfirend in Edinburgh for a while. Lately they haven’t been getting along very well. Jean Baptiste works in a kitchen run by the oppressive minions of the restaurant’s owner: the Fat One. It’s hell on earth, literally, the kitchen is built at the mouth of one of the seven gates to hell. He works twelve hour days and the company’s unrelenting cost-cutting strategies force their employees to sink to ever lower levels of depravity for the sake of company profits. JBB is tired. Still, as all great poets, he utilises his suffering to advantage, creating particularly spirited (but awful) poetry from his myraid experiences. JBB longs for a change of scene and is ripe for manipulation. Out from Nobrow Press next monday 27th Feb!